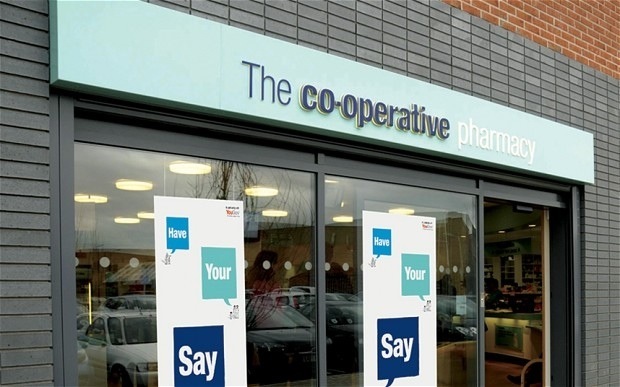 The Co-operative Group has hoisted the ‘for sale’ sign over its farming and pharmacy businesses as it seeks to reduce its £1.2bn debt pile amid mounting losses. The troubled mutual – which is in the midst of a group-wide strategy review aimed at finding ways of generating new capital – is on track to make losses in excess of between £1.5-2bn for the 2013 financial year. The Co-op would not comment on reports that those losses could be £2bn, ahead of preliminary results for the year to December 2013 scheduled for March 26. However Mr Sutherland did admit to The Telegraph a week ago that the Co-op’s 2013 results would be “ugly” and the worst in its history. In a brief statement, the Co-op confirmed that it has deemed its farms business – thought to be worth in the tens of millions of pounds – as “non-core” and has begun a sales process. The business runs 15 farms and employs some 200 people. It also said that it has begun “exploring options” for its pharmacy business, which operates from 750 shops and has more than 6,500 staff. The statement confirmed that that process could lead to all or part of the pharmacy division being sold. The pharmacy operation generated £28.2m of operating profits in 2012 on sales of £764m. It serves approximately 200,000 customers a week, but the bulk of its trade comes from fulfilling NHS prescriptions, which is an increasingly difficult business to make money from due to Government cuts. It is run entirely separately from its supermarket business. To grow it is thought the business would need to be integrated with supermarkets, which would require significant investment of the like the Co-op cannot currently afford. If both divisions were to go, it would leave the Co-op with retail, banking, insurance, funerals, electrical and legal services as its main operating businesses. The sales will be seen as the next step in stripping back the Co-op to its core operations, following the sale of its life insurance arm to Royal London last year, and the loss of control of its banking arm following its £1.5bn recapitalisation in December. Co-op Group chief executive Euan Sutherland, who is leading the overhaul, signalled in an interview last week that the farming business was vulnerable. “The point to understand about farms is people think we have farmland which produces product which comes into our shops. That’s not necessarily true,” he said. Peter Marks, Mr Sutherland’s predecessor, has said publicly he tried to sell the farming business when he was in office – but was blocked by doing so by the group board. Unlike most organisations, the Co-op’s unique structure means that its board – which has the final say on major strategic decisions – is made up of elected members from its national structure of committees. The pharmacy business dates back to 1945, and is the third largest chemist in the UK, after Boots the Chemist and Lloyds Pharmacy. Its value to such larger trade players is questionable, however, given the size of its two main rivals and the likelihood of competition inquiries, and so the most obvious acquirer may be a financial backer such as a private equity house. The confirmations come ahead not only of the mutual’s full-year results but also of Mr Sutherland’s strategy review announcement, scheduled to take place at the Co-op’s annual meeting in early May. That meeting will also see the publication of the results of the ‘Have your say’ survey of members, suppliers and customers, which in its first week elicited more than 80,000 responses. The survey, being conducted by YouGov, is aimed at understanding what different constituent groups want from an organisation like the Co-op in the 21st century. Posted on February 26, 2014, in #retail, #uk. Bookmark the permalink. Leave a comment.